Anxious to get back to work???? I’ve officially been away from my crafty supplies too long. All my papers and pretties to play with. I have enjoyed my mini vacation…and spent some wonderful time with my family and friends….but I am a creative soul…and without a project to work on…I’m a little lost. I have tried to fill my down time while the peeps have slept in working on collages so when I do get back to the shop I will have some focus on projects that I really want to tackle first. 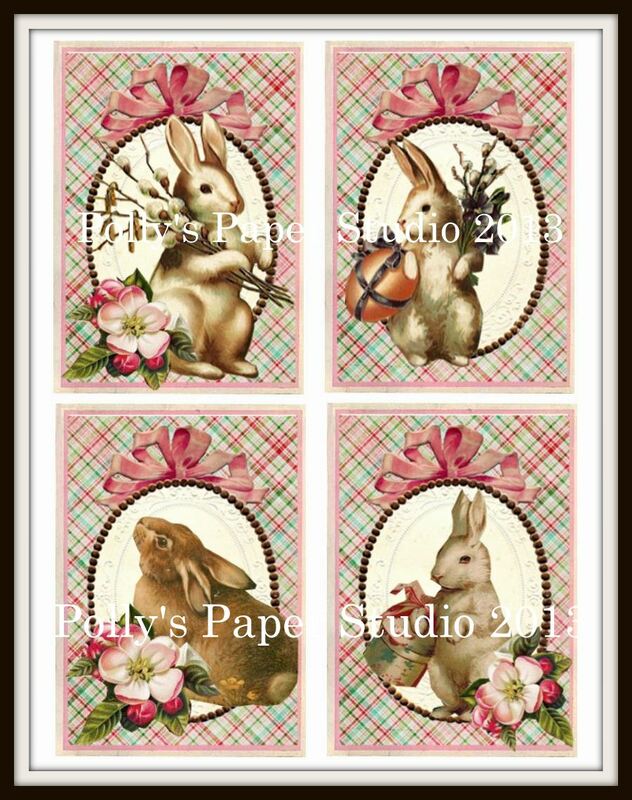 These little sweet bunny images will make great cards for my Peeps : ) I love the shabby colors! 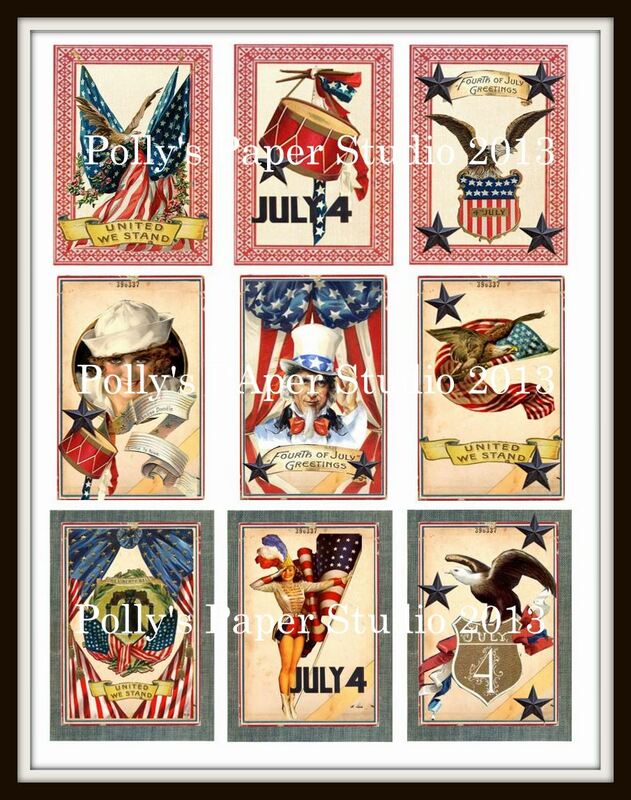 Yes…I know I’ve told you all that not only are we a fiercely patriotic family….but the 4th holds a special place in our hearts here at home as it’s my dear Hubby’s Birthday….so I created this collage with plans to create like a gazillion tags to add to our patriotic decorations for his 4th of July tree…. Another Goal I have for the new year is to create more art journals so I’ve been planning ahead and making more images that I can add to the journals with lined sections and beautiful large floral images that are just calling out for some Stickles! 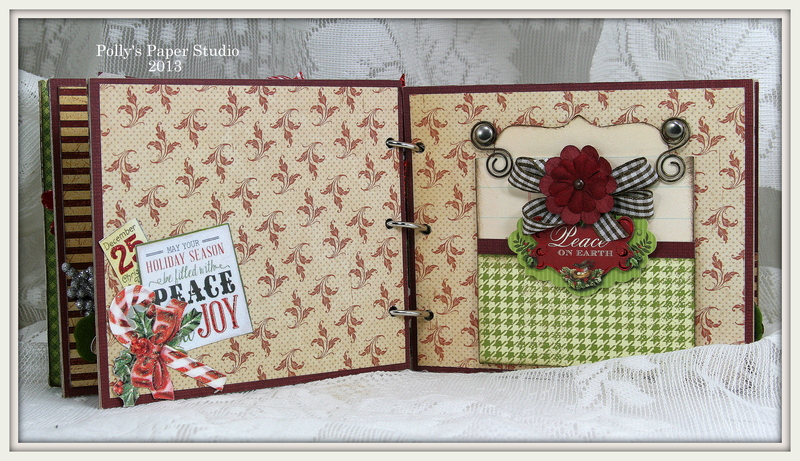 These are a great size to work with as they can be pockets in larger books…or pages in smaller journals. I’m pretty excited this morning because this is the day our Tuesday Night Peeps are having our Christmas get together : ) I should probably be curling my hair and putting on my eyeliner right about now….so I’m just popping in to share a sweet new collage I created just in time for New Years : ) I think I will print out a set of these great Bingo images and make up a quick banner. All I have to do is trim them out…add tons of Stickles and some pretty ribbons from Really Reasonable Ribbon of course! But not until after the party lol. 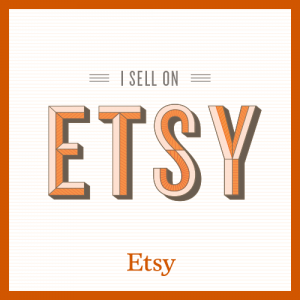 If you’d like a set of these for yourself….just follow the link over…it’s available for instant download so you can get your craft on with it right away! 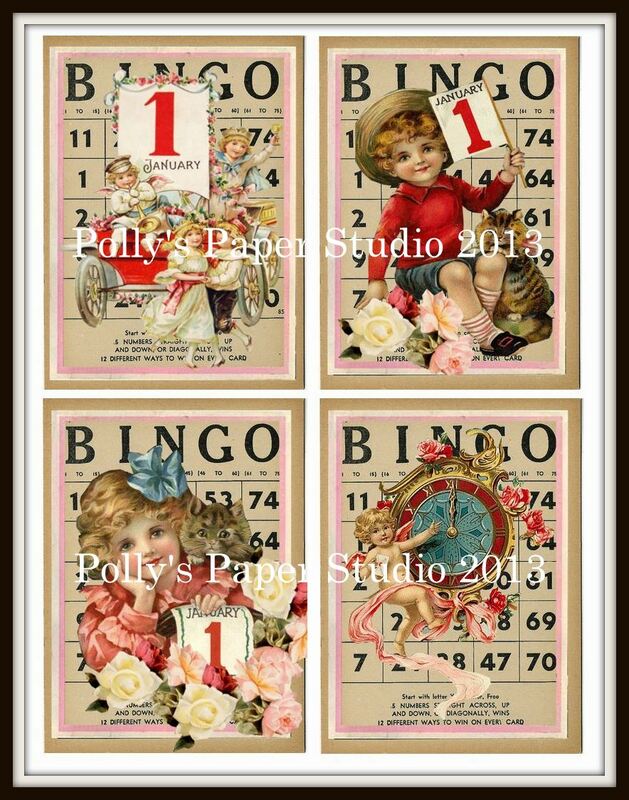 Vintage Bingo New Years Eve Cards. 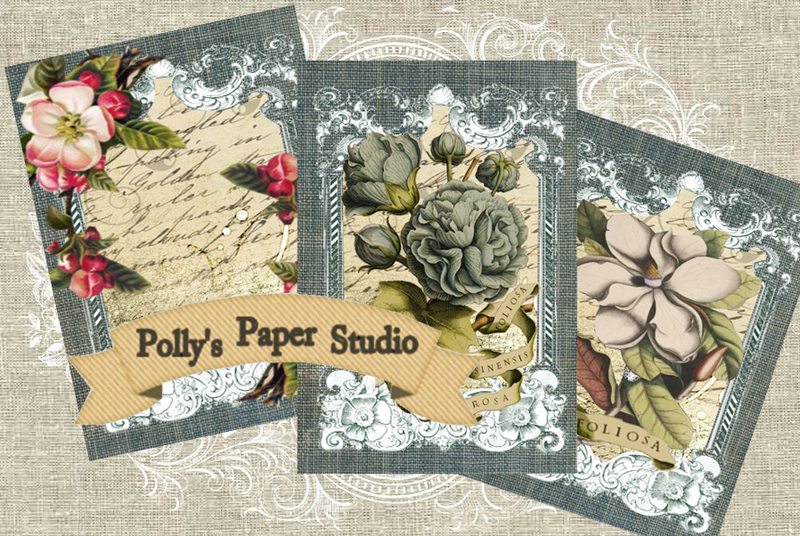 I’m calling this one Vintage Book Cover Cards. 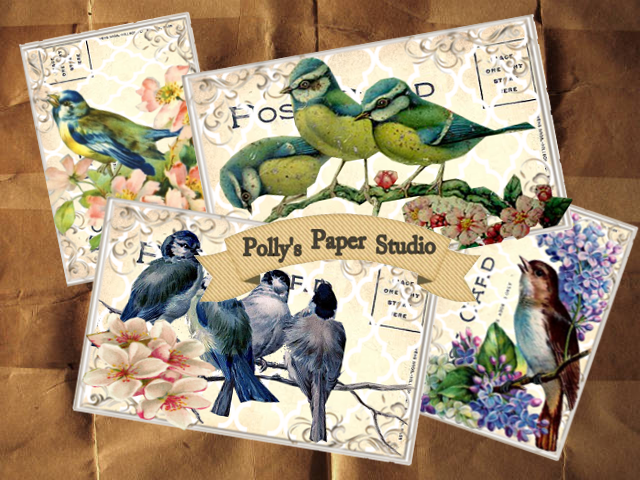 There’s 4 nice large images….so you can make quick cards or add them to your scrapbooking and paper crafting. Of course I’m calling this one Birds of a Feather. 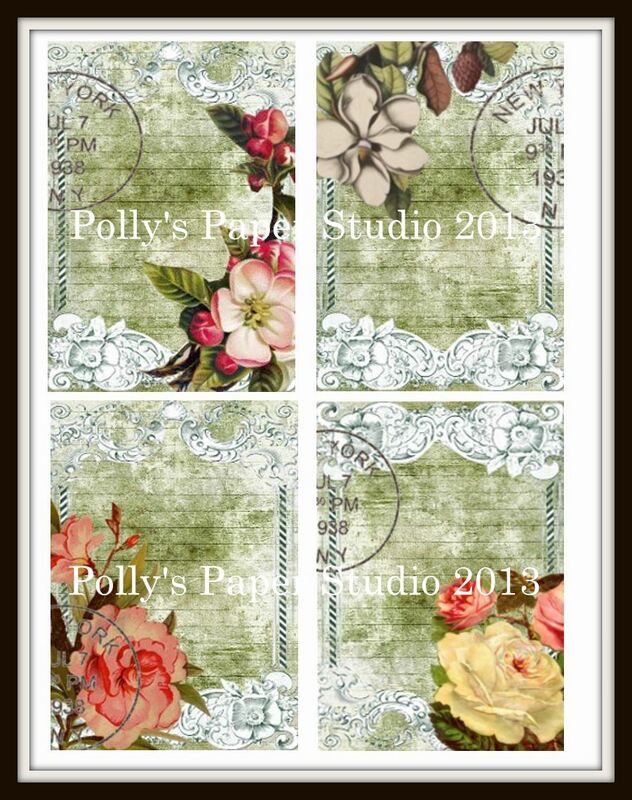 This sheet is perfect for all types of cards…or maybe even strung together to make a banner? 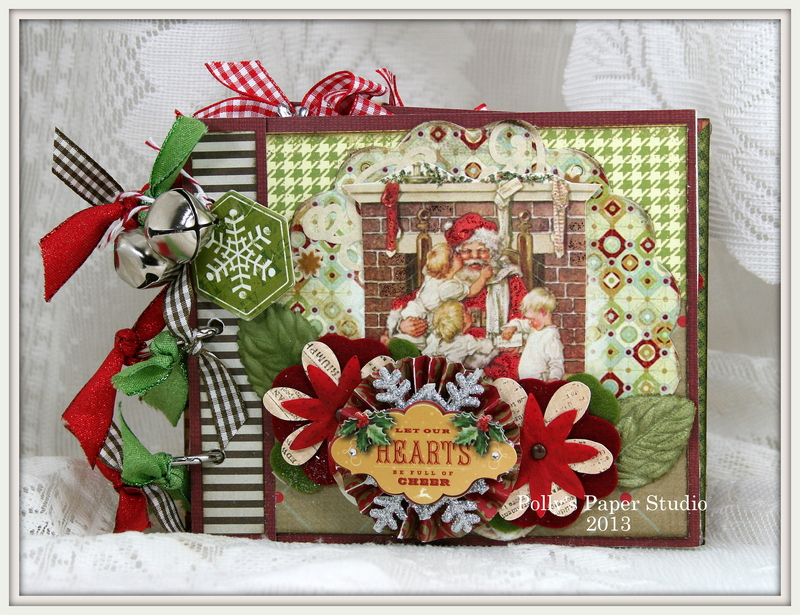 I can not wait to get to the shop and create some sweet Valentines with this Heart Collage. This printable Baby Banner Collage has an extra sheet of banner shapes so you can string as many together as you need to fit your space perfectly! Well it’s Christmas time again and I hope this post finds you happy healthy and surrounded by the ones you love the most. Even if your family is far away…keep them close in your heart….and they’ll be “home” for Christmas. I won’t take up too much of your time this morning as I know you’re like me…..knee deep in wrapping papers…trying to get the best family pictures to add to your scrapbook…and getting ready to prepare your holiday feast. 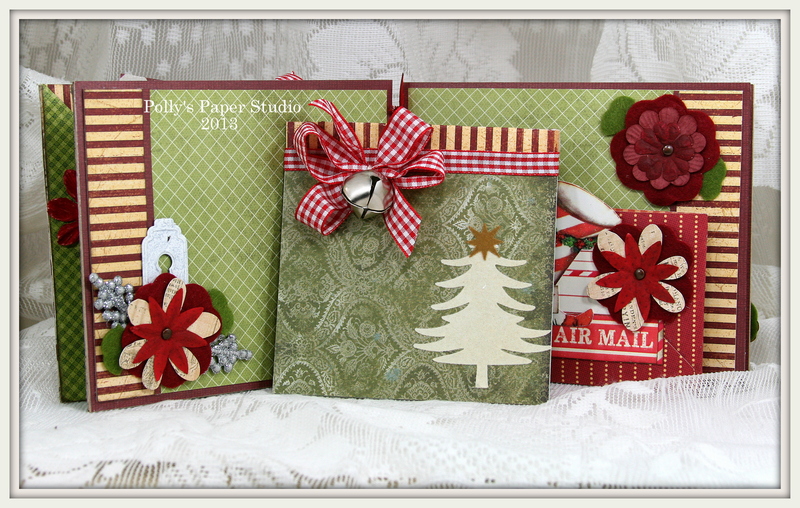 So I’ll just share the pics of my fun and festive Christmas Mini Album. 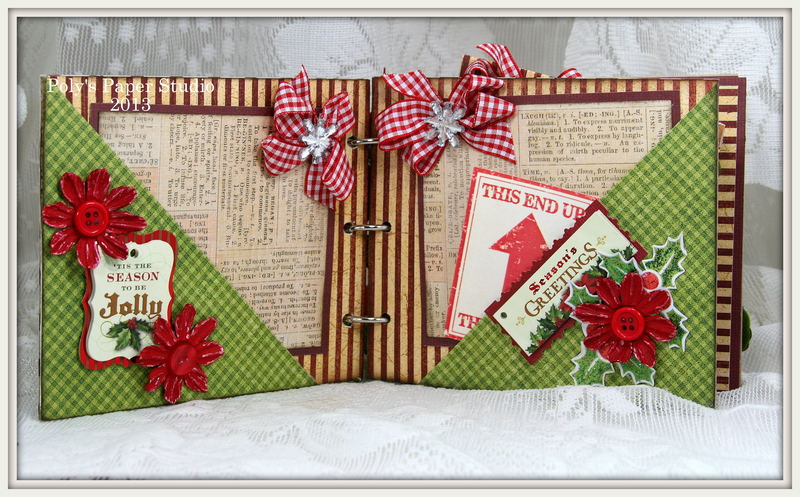 I used the Glitz Ribbon in Red and Green, and Gingham in Green and Red. All from Really Reasonable Ribbon. A special friend gave me a very unexpected and generous gift last week. I was so moved by the surprise. 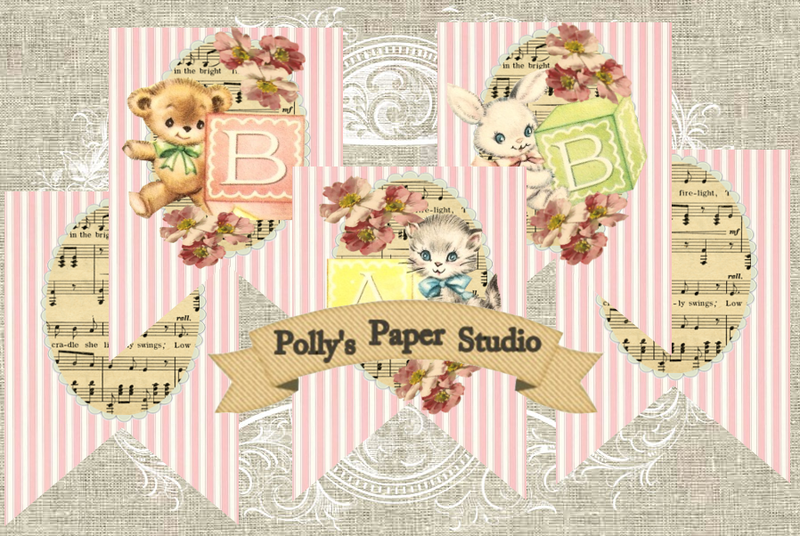 I created this card for her to thank her for her kindness…I just love her so much!!!!! 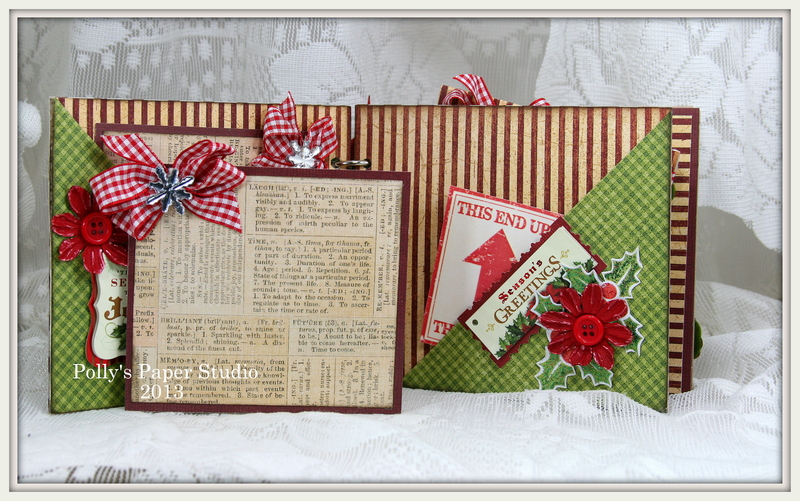 I gathered lot’s of shabby inspired papers and stitched them up to create a base for some festive Christmas trimmings. 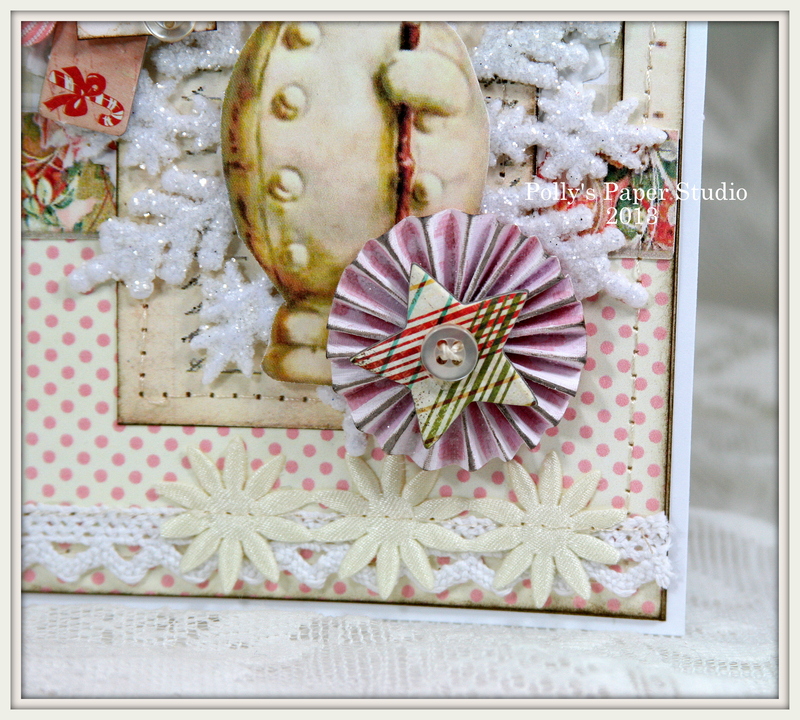 I layered on a pretty poofy bow made from Chevron Striped Pink Twill from Really Reasonable Ribbon, topped off with a sparkly jingle bell, a chipboard tag, and a thank you tag with a vintage button. Isn’t that snowman charming???? Fun snowflake trim stitched over Amelia White Crocheted Lace across the bottom of the card is a nice girly accent. Last but not least there’s a painted, and inked and glittered paper rosette topped off a chipboard star and another vintage button. So it’s the first day of my Christmas vacation and what am I doing? 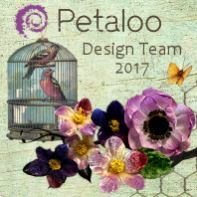 Designing digital collage sheets. Any normal person would have slept in…had a leisurely coffee…..start making last minute gift lists. However I live in a house with Scooter. And there is no better alarm clock than a hungry cat…so hello to 5 am. 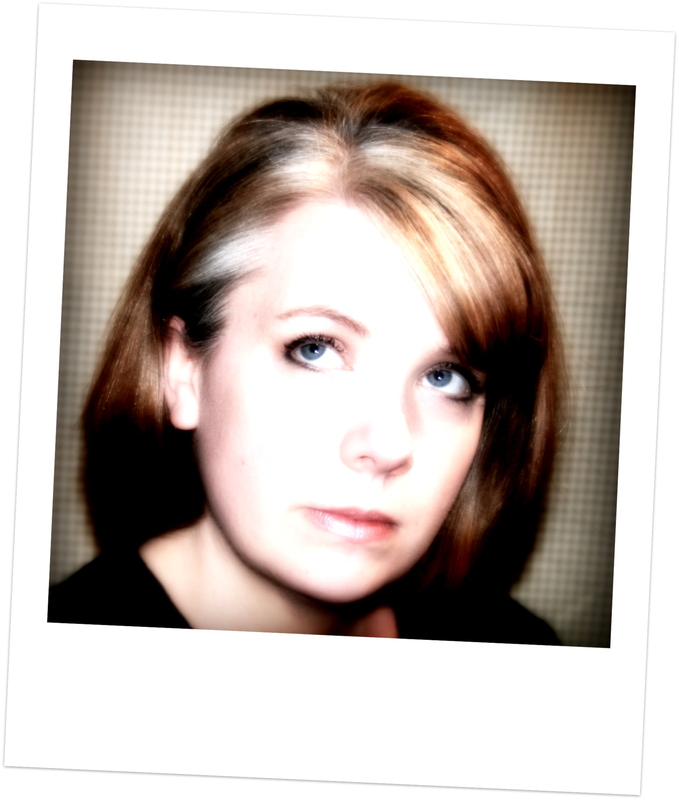 While the rest of the home Peeps were snuggled in their beds…I’m cropping and snipping and layering away. My first collage Vintage Valentine’s Cards. 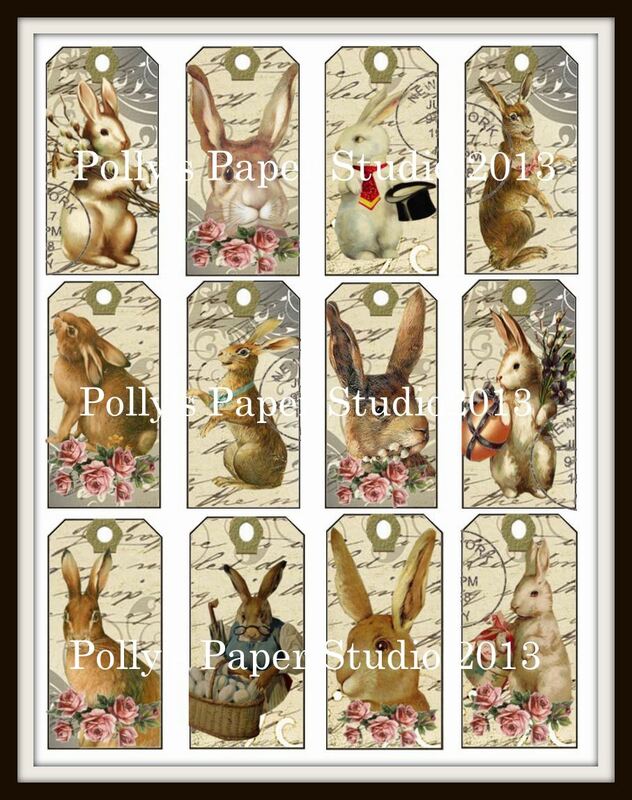 The second collage Vintage Easter Tags. Okay….I’m off now to bake up some cookies…I just found a great recipe for gingerbread that doesn’t have to be rolled and cut…that’s perfect for an impatient baker like me. I hear there’s a a big ice storm coming to mid Michigan so I could say I’m preparing for a power outage…no one will go hungry if we have cookies right? 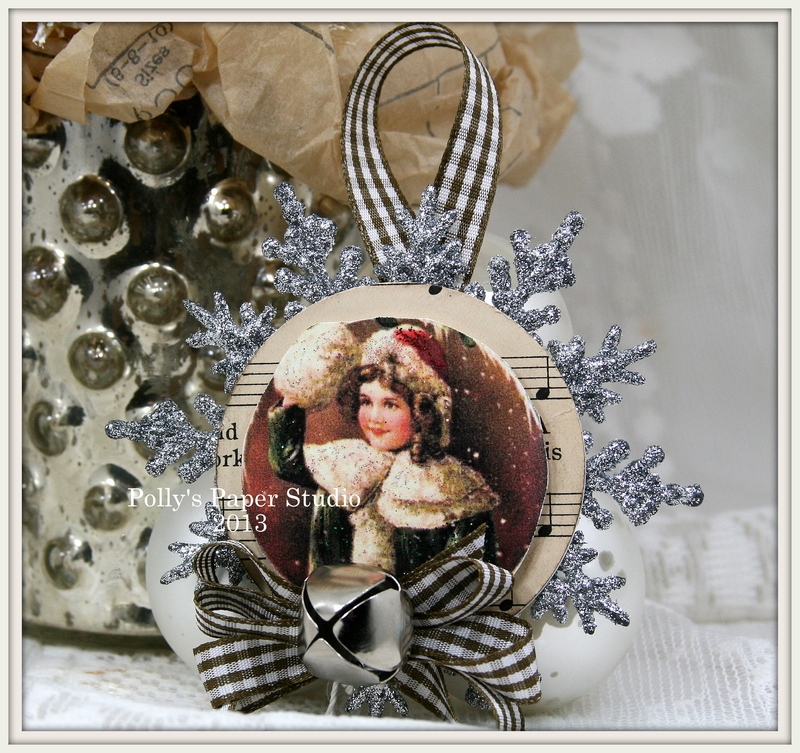 Here’s 2 more ornaments we created in class last week….as promised. We had so much fun working with all the trimy bits and pieces. I will say though that it is no time soon that I will be rid of the glitter on the tables and floor and tools and chairs and displays….well….pretty much everywhere. It’s all good though! 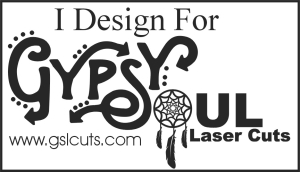 This one has a bingo card cut into a banner shape. We did add a layer of book board behind to make it sturdy enough to hang a festive ball ornament…on an eyelet of course so it wont pull out. The Santa image is one of my favorites from Graphic’s Fairy. 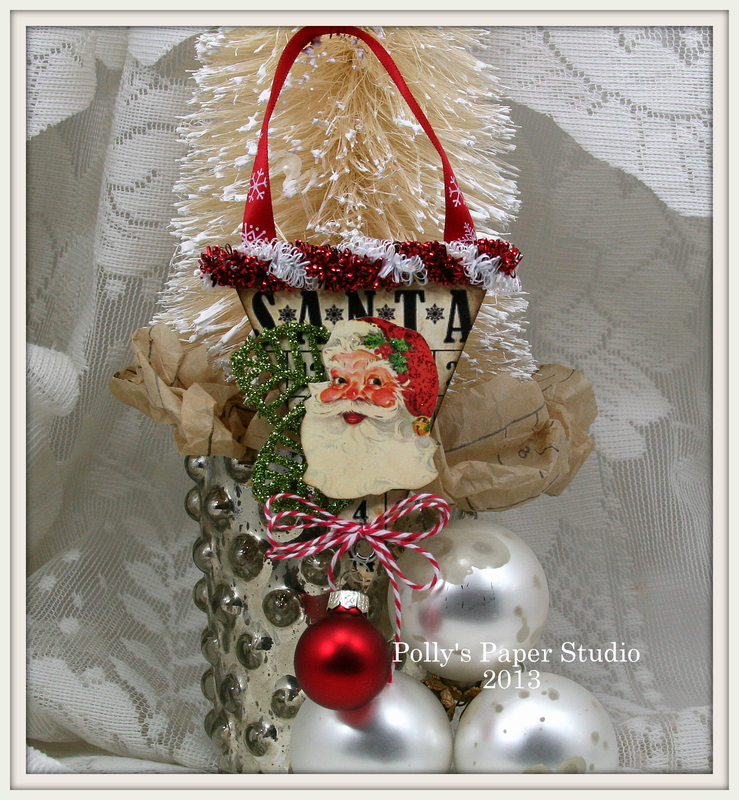 There’s also fun tinsel trim, glittery leaves and a handy dandy hanging loop made of Snowflakes on Red Satin. Last but not least a sweet little bow of Baker’s Twine in Cherry. 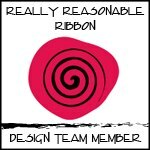 From Really Reasonable Ribbon! 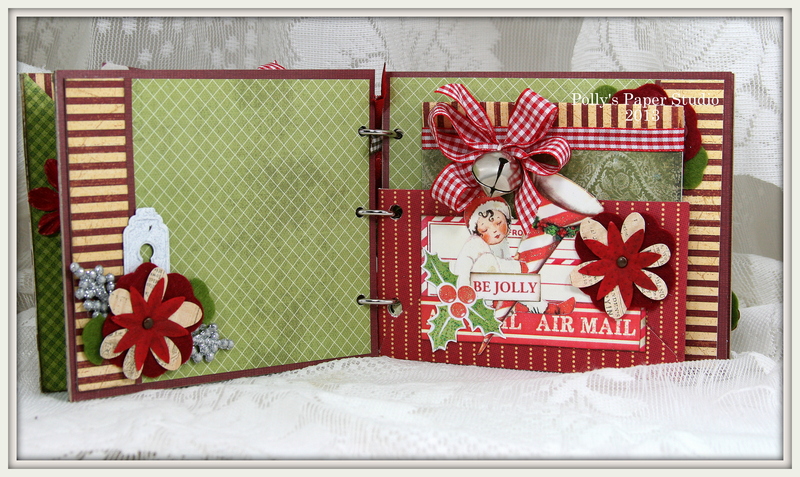 This is one of my favorites of the season….as I have really embraced my retro mojo this year. This ornament is very traditional. We layered a lovely vintage image onto sheet music on pop dots for extra dimension. Then we added it to a sparkly snowflake ornament. The Moss Gingham bow matches perfectly and is topped off with a large jingle bell : ) I added a bit of the trim to create a hanger.